Containment is a documentary that weaves three stories about nuclear waste. The first is a look at post-Fukushima Japan. 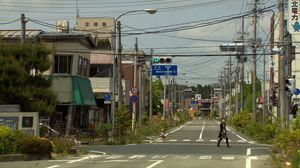 The opening image is of an abandoned town full of recent signs of life and industry. Those who fled because of the Fukushima accident still have not come back. There is also footage from inside a damaged reactor that I hadn’t seen before, as well as some new footage from the tsunami. The second is the Savannah River Site in South Carolina. Reverend Tomlin, an activist, takes us on a boat on the Savannah River. There are no-fishing signs, but they don’t say why. Narrators tell us what’s there (lots of radioactive waste) over creepy film footage from the 1950s. One of the old scenes shows cardboard boxes (!) of “radioactive waste” being buried under fifteen feet of soil. There are better containment solutions than dirt and cardboard, including steel tanks buried under stories of soil. But as someone points out, if the tanks were to dissolve, they waste would get to the Savannah River. With Yucca Mountain bowing out of America’s nuclear storage, the site in Georgia has become a de facto high-level waste storage facility. The third story shows the small-town politics of Carlsbad, New Mexico, which is the nearest city to the WIPP — the Waste Isolation Pilot Plant. The WIPP will hold nuclear waste in a salt mine, 600 meters below the surface of the earth. The footage from Carlsbad shows the best of America’s can-do attitude. Workers in polo shirts and hard hats maneuver containers of nuclear waste as if it were cereal at Sam’s Club. The optimism is only slightly tainted by a small fire deep in the WIPP that resulted in some radiation exposure for the workers. Containment brushes against the design problems of warning humanity about the poison for 10,000 years. One designer mentions the possibility that a future tunnel from Houston to San Francisco might plow through the toxic waste — the point being that maybe we need markers in a sphere around the waste, and not just above it on the ground. But a far more interesting film on 10,000-year design was already released a few years ago. Into Eternity made the film festival rounds about four years ago, and was a much more focused and entertaining documentary. The pace of Containment is “deliberate” — someone else might say “slow.” People speak, and then the film gives a pause to let the words sink in. It’s a little hypnotic, which may not be a good thing if you’re cramming lots of films into your head at a film festival. I’m not sorry I saw Containment; it offers food for thought on what to do about our nuclear waste. It also showed that it’s possible for a community to embrace nuclear, as Carlsbad has done. But if you’ve had your fill after seeing Into Eternity, it’s probably safe to skip Containment.